Want to get the best possible bike-mounted view of LA? 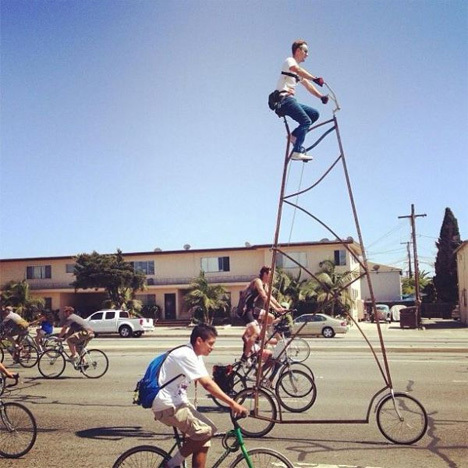 Richie Trimple’s Stoopid Tall 14.5 foot-tall bike will let you pedal your way around while looking down on everyone and everything in sight. The unique bike isn’t the easiest to balance on, and Trimple has to lean it against a building and climb up its insane frame just to sit on it. But once he gets going, the view from the top is totally incredible. Stoopid Tall, the result of a friendly challenge, took around 12 hours to build. Frames, tubing and various parts were combined to create this monstrosity of a road bike. The bike’s chain consists of six standard chains together, equaling 32.5 feet of chain. After cobbling the bike together, he wasn’t sure that it would ride. But check out the video above and see just how awesome this Frankenstein’s monster of a bike really works. See more in Art Vehicles or under Transportation. June, 2013.